Francesco Chiabotti, Eve Feuillebois-Pierunek, Catherine Mayeur-Jaouen et Luca Patrizi (éd. 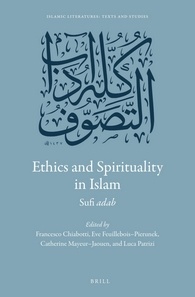 ), Ethics and spirituality in Islam: Sufi adab, Brill, Leyde, 2016, 792 pages. The notion of adab is at the heart of Arab-Islamic culture. Born in the crucible of the Arabic and Persian civilization, nourished by Greek and Indian influences, this polysemic notion could cover a variegated range of meanings: good behavior, knowledge of manners, etiquette, rules and belles-lettres and finally, literature. This collection of articles tries to explore how the formulations and reformulations of adab during the first centuries of Islam engage with the crucial period of the first great spiritual masters, exploring the importance of normativity, but also of transgression, in order to define the rules themselves. Assuming that adab is ethics, the articles analyse the genres of Sufi adab, including manuals and hagiographical accounts, from the formative period of Sufism until the modernity. This entry was posted in Publications and tagged Mayeur-Jaouen by Jean. Bookmark the permalink.